it makes trouble when you don't come tomorrow. futa-koginu (work clothes) in toki color. Should also be an urgent order. or, do you need some help? but it bothers me because of pointlessness. A dyer is drawn in this block. 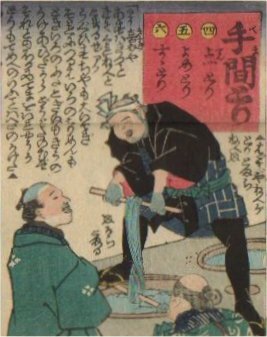 Carpenters and plasterer wore half cut hanten (a workman's coat) and loincloth only at first, then it turned to momen (cotton) hanten, momohiki (pants) and harakake (apron) in dark blue. Hanten were dyed mostly in indigo. The foreign visitor to Edo praised this color so highly, named it "Japan blue".